Some of you may encountered this problem. You install new Magento extension through downloader, try to access its configuration settings and Magento throws “Access denied” page at you. Although you’re administrator of the system. So what happened here? Magento just doesn’t have stored privileges for this new extension. First just try to logout and login again. If that doesn’t work, you need to reset admin privileges. 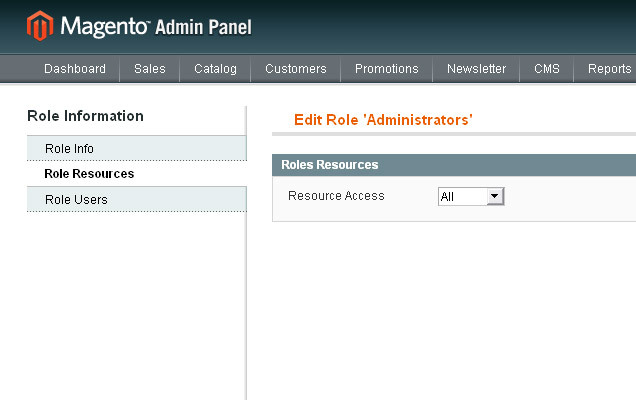 Navigate to System->Permissions->Roles and click Administrators role. Check your Role Resources settings just in case, Resource Access dropdown should be already set to All for administrators. Without changing anything just click “Save Role” button, so that Magento re-saves all permissions. You should be able to access your new extension now without problems. It seems that the write permission for modules with wrong or missing ACL are set to false by default even if they do not appear under role permissions. Setting the admin permission to “all” overrides this effectively. 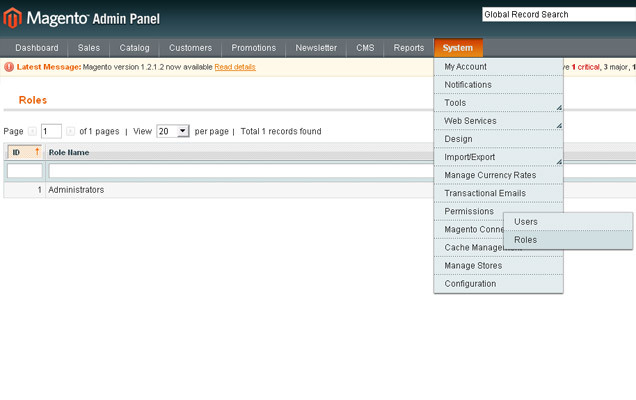 Friends, I created a role for user to access catalog only in magento’s admin panel. but by mistake i assigned those to admin. Now through admin login, I can’t see anything in my panel except catalog.. how should i re-manage those rule to admin. I am using magento 1.8.0 on http://www.indianfashionfollower.com. In backhand majento panel i was creating New user and its role by mistake i choosed custom then suddenly configuration has been saved. After I got screen like Access denied (Even No Categories and configuration like Dashboard, Catalog, System) not showing at all. I have changed role permission from administrator to custom and give only product mange permission.Now I have not any option to access admin panel.help me please. Thanks logging out and then logging in worked for me! Keep up the good work. I have try this plugin on my localhost it is not working… plz tell me. is there any configuration issue. Many thanks, magento should do this automatically. I installed Inchoo Featured Products extension and it did not appear under Configuration – Catalog – Featured Products. I tried many ways to fix this but none of the ways helped. Per “CJ Says” recommendation, I went to System –> Cache Management and selected all option and refreshed them. And it fixed the problem. Now I can access Featured Products under Catalog – Featured Products. Wow this page is awesome! helped me alot in the learning phase of magento! keep on that incredible good work! Now I am back in the the admin tool…but still seeing Access denied inside and menu options are all gone. Wow…I am completely locked out. I created a new login via the db and still get “Access Denied”. PLEASE HELP! This is a huge problem. We are using Magento 1.4.1.1…I’m not seeing any folders called inchoo. We installed the 1.4 extension. I’ve been trying to do this for a while and never succeeded. Say i have to create different role, let’s say manager, which under any circumstances shouldn’t have all privileges. That’s no problem for standard Magento, but is a problem if you want to grant that role the privileges for an extension (for example, the Inchoo Gallery module). I tried inserting the admin rules manually in the db tables but still haven’t succeeded. Anyone know some way i can get this to work? i have a big issue, i selected custom under roles and did not check any of the modules / menu. 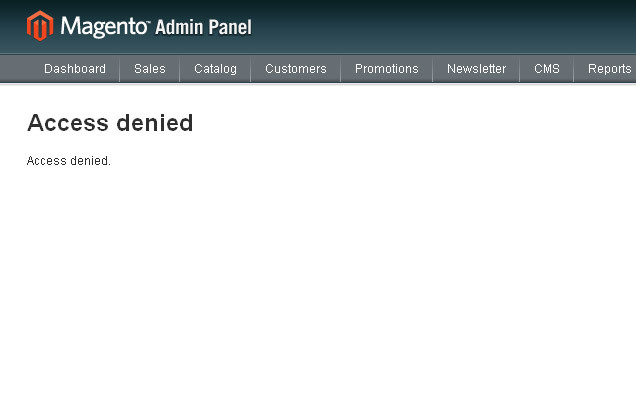 so the next time i logged in, i dont see any menu in the admin and i get only access denied error. Please help me to get this feature work in megento 1.4..
@AK Thanks for the reply. I’ve checked that folder permission is 755 & all 3 files are set to 644. Still getting access denied though. Are these the only files associated with the extension? The featured products link under Catalog is also not appearing, the only link is under the configuration which is where I get the access denied. Any other suggestions would be much appreciated! @AK Thanks for the info. Still having problem though. The files are located under app\design\frontend\default\default\template\inchoo (block_featured_products.phtml & view.phtml). They are both set to 666 permissions is that correct? The inchoo/ folder is 777. I’ve tried uninstalling / reinstalling. Strange thing is if I modify the administrator Role, and set the permissions to ‘Custom’ and the tick all the boxes the Featured products link no longer appears in the admin. I’m not sure if this is related or not. Thanks for sharing the great tip to solve the error. also check the extension files and folders permission and try to reinstall it. I’ve just installed the Featured Products extension into Magento 1.4. & getting Access Denied when I try and access the Featured Products page under Configuration. I’ve tried logging out & logging back in. Updating the Administrator Role and nothing works. If using 1.4+ and none of the above works you can try adding the node from config.xml to a new file adminhtml.xml in your module’s etc directory. i have installed EasyFlag extension and after this i got Access denied when im trying enable extension for store views via System > Configuration > Templates-Master > EasyFlags. re-save admin role and logging out after instalation doesnt work, still Access. any suggestion ? I fixed the database. The problem was in admin_role table – I had to add additional role there, and change rule_id in admin_rule table in the original db. I’ve got the same problem as Chris. You said “please check admin_user,admin_role,admin_rule table.according to my perception you changed the permission that’s why you got “access denied” error.”. What exactly should I check in these tables? I tried to set privileges to “all” in “admin_rule” table, but it didn’t help. @chris please check admin_user,admin_role,admin_rule table.according to my perception you changed the permission that’s why you got “access denied” error. @ivan Thank you for the reply however I am running version 1.4. What I did is made sure that admin role was set to ALL for permissions and it was but I hit save to make sure, when I did that I got Access Denied on the page, I then loged out and tryed to log back in with my admin info and got “Access Denied” not “Invalid Username or Password”. I then reset the password and still the same issue, I then opened the DB via phpmyadmin and looked at table admin_user to verify that my admin info is right and it was, my permissions are set as ALL in the DB so I don’t know why I can’t log back in. Any thoughts??? In older Magento versions you need to reset admin privileges sometimes. This was changed in 1.3.x versions where is enough to logout and login again if you have similar problems, assuming that it’s not the problem in the extension you’re trying to install. Great, i have the same issue I can’t log back into admin, now what? What if you are locked out and the function “Permissions” is not shown anymore after succesfull login using admin login account? Thit happend to me after making a new Magento admin user and trying to restrict some of its rights. Logging out and back in worked for me. Thanks a lot. I see this problem sometimes, when, my url expries due to inactivity and I click on / login / go to same url automaticall – the KEY seen in url does not exist. So, it gives out the message to me. Hey, thanks for the info. Example would be great! Good piece of advise. I talked to Yoav about this issue and they are aware of it. He advised that they will probably be fixing this shortly. However it can be fixed by writing some code in the setup script that runs when you first install the module. I don’t have example code at the moment but will be posting it shortly.